Here’s an interesting story and a bunch of cool photos looking back to the days when streetcars crisscrossed the Valley. 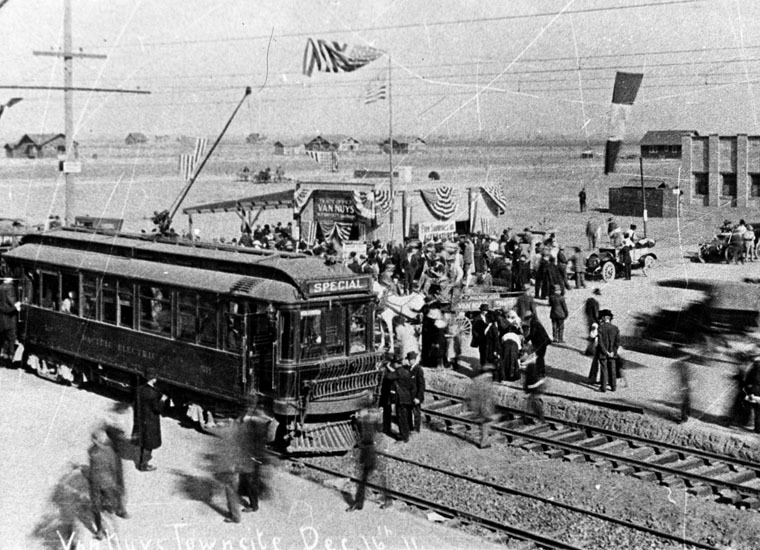 Note that some of the photos are of rail running on what is now the popular — and soon expanding to Chatsworth — Orange Line. It’s from a book about Pacific Electric Red Cars by David Coscia, “Pacific Electric and the Growth of the San Fernando Valley.” Looks like fun. UCLA traffic is the lightest it’s been since the university began measuring, more than 20 years ago. Currently 52.9 percent of employees drive to work alone, compared with nearly 72 percent of Los Angeles County drivers. Only 25 percent of students drive alone. To help achieve this, UCLA offers incentives, including a 50 percent subsidy for transit passes, discounted parking for carpoolers and a partially subsidized vanpool. UCLA is dangerously close to achieving its goal of 50 percent ride sharing, which is part of the campus Climate Action Plan to reduce greenhouse gas emissions to 1990 levels by 2020. Metro sponsors a partially subsidized vanpool program. Can we interest you? Chicago is embarking on a $7 billion plan to transform the city’s infrastructure. It includes $1 billion for the Chicago Transit Authority to renovate more than 100 stations and eliminate “slow zones” that cost riders an estimated 11,000 hours of delays every day. Funding will come from the newly created Chicago infrastructure Trust, an initiative announced this month by Mayor Rahm Emanuel and former President Bill Clinton — a long-time supporter of energy efficiency. The fund, a nonprofit corporation, pools outside investment and applies it to a wide range of possible projects. The city estimates the initiatives will create 30,000 jobs over the next three years, helping to put the city that works back to work. Similarly, Metro’s 30/10 Plan to accelerate construction of Measure R projects could generate tens of thousands of jobs. Could transit projects be the engine that help restart the economy? blue line fare was increased but the service should also need to improve.